Bob Abadie joined the 23d Street YMCA in New York City as a teenager. His appearance at the Y coincided with the arrival in the mid-1890s of basketball, the new sport that was sweeping into prominence at YMCAs across the country. The tall, athletic youngster was an immediate standout on the courts. In the 1896-97 season, with Abadie as captain, the 23rd Street YMCA won the National Amateur Athletic Union title. The following season, the 23rd Street team lost just once in thirty-four games and again won the AAU title. In 1898, the players decided to turn pro and were quickly banned from the YMCA facility. Unable to find a suitable playing site in New York, the club began touring throughout the Northeast. In February of 1899, the team (now known as the 23rd Street Wanderers) administered the powerful Trenton National Basketball League team its first home-court defeat in four years with a decisive 25-9 thrashing. Abadie coached the team and took pride in his role as the Wanderers’ primary defensive specialist. In an era of man-to-man coverage, Abadie always guarded the opponent’s top offensive star. In the fall of 1899, the Wanderers joined the NBL and remained in the circuit for the next four seasons. They won the league title during the 1901-02 season, a remarkable feat considering they still did not have a home court and played ever league game on the road. In 1903, the Wanderers joined the Hudson River League, but the circuit was unstable and barely lasted one season. 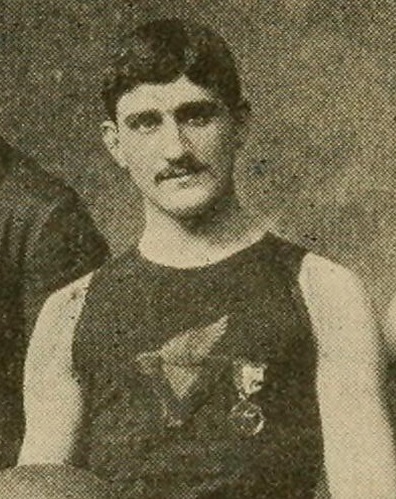 Abadie continued to barnstorm with the Wanderers for five more seasons before he retired from basketball in 1911.